Custom fitted poly-serge fabric with moisture-wicking functionality. Custom flex-fit polyester-spandex fabric with moisture-wicking functionality. Flexfit Pro Model wool baseball cap. 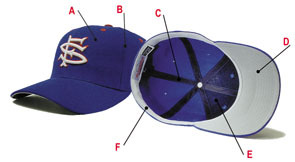 Pro Model mesh baseball cap with SYSTEM 5 sizing. Pro Model mesh baseball cap with low pro shape. Pro Model, cotton twill baseball cap available for on or off field use. Heavyweight brushed twill baseball cap. B, C - all seams are covered with cotton tape using a unique process that splits the fabric and creates a flat, smooth seam. Perfect for applying embroidery. D - all style have sturdy polyethylene visor with our unique "pre-curved" shape for the proper look right out of the box. F - All Pro model caps have a heavy weight 1 3/8" twill sweatband with nylon backing for comfort and sweat absorption. Interlocking letters & Custom Logos require a one time set-up fee. No set-up fees on 72 caps or more. Name Drop designs are an easy and creative way to give your school, event or company name a new and exciting look. Choose the design you like and change the words, mascots and/or objects to fit your needs. Name Drop designs do not require a set-up charge and provide faster delivery time than custom designs. Our large selection of Stock Mascots can be combined with Stock Wording, placed in a Name Drop or used alone for full front, side, or back position embroidery. Stock Objects can also be combined with Stock Wording, placed in a Name Drop or to be used alone for full front, side, or back position embroidery.